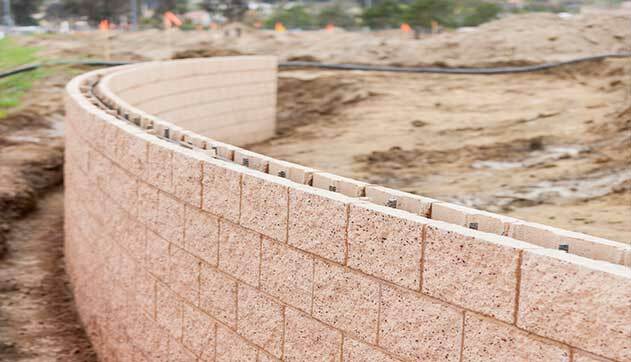 Find Ramsey retaining wall construction experts when you call (201) 327-5258 today. We will provide you with a free estimate, then suggest options for your specific situation, so you have the best retaining wall possible. Click here for valuable specials and coupons. Homeowners, business owners and property managers are always looking for new ways to add beauty and character to their properties, while serving valuable functions at the same time. One way they accomplish this is by adding a retaining wall or two to the property. Find out what people have been saying about our business when you click here now. A retaining wall refers to a barrier or structure that is designed to hold or “retain” soil on unnatural slopes. If the wall was taken away, the soil would fall onto the grass, sidewalk or whatever happens to be below. These walls are used in a wide variety of properties, and it is usually for aesthetic purposes, as they can greatly enhance the look of the property. They may also be used in areas where the landscape dictates a need for shaping when there is a roadway overpass or for farming on a hillside. Retaining walls may be made from rocks, boulders, poured concrete, treated timbers or concrete blocks. There are several different types of retaining walls to choose from when planning your landscaping. Not all will work for every situation, but you can go over your options with your contractor to find the right one for you. Some of the more common options include gravity walls, reinforced gravity walls, precast concrete retaining walls, brick retaining walls, stone retaining walls, reinforced soil walls and anchored earth. Before you make your final decision, consult with a professional contractor so you are certain that the type of retaining wall you like matches the purpose. It’s frustrating to get excited about a certain style or material only to discover it isn’t possible for your particular application. Safety is always the biggest consideration, and knowing you are making a safe choice will help with your peace of mind. For the installation, look for a local and reputable contractor, as proper installation is a must. There is a possibility for serious injury if one of these walls ever collapsed, and if you’ll have children or pets in the area of your wall, it has be professionally installed and as safe as possible. If you’ve been thinking of a retaining wall to add beauty and stability to your property, call McFarlane Asphalt at (201) 327-5258 in the Ramsey, NJ area today for fast and reliable service. We will send someone over to your place to survey the situation and find the best option for you.